Recently there was an article in the New York Times, which, surprisingly enough, reported reasonably accurately and interestingly on the work of an historian of science, William Newman (who I mentioned in my previous post on 19th-century views of alchemy). 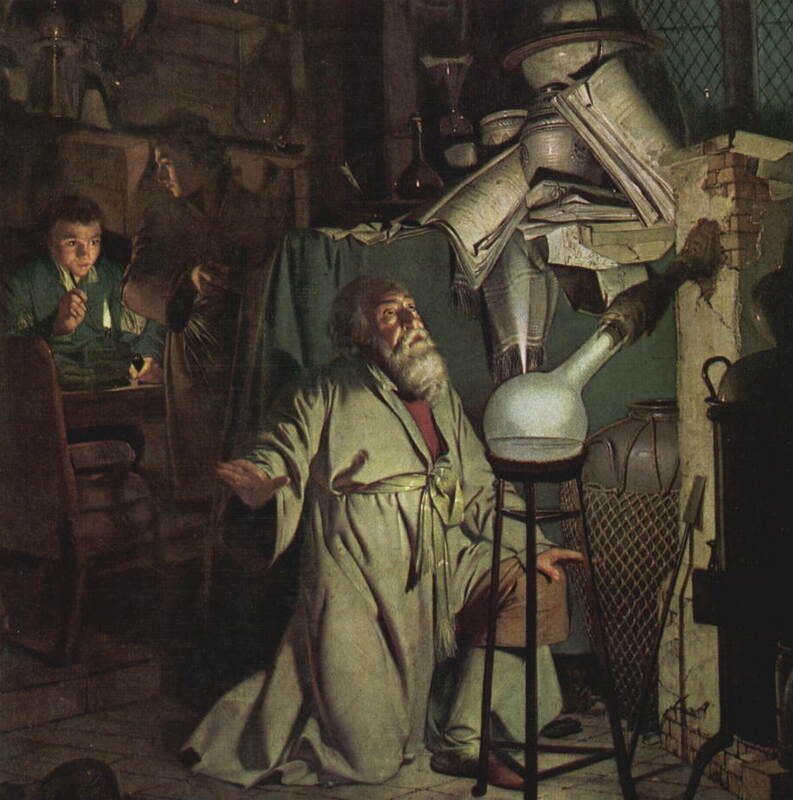 In the article Newman says, of course, that it is not surprising that Newton should have been interested in alchemy; that alchemical work was not diametrically opposed to the ‘scientific’ work Newton did in mathematics, optics and astronomy; and that, altogether, “It was perfectly reasonable for Isaac Newton to believe in alchemy”. Yet the title of the article bugged me: “Moonlighting as Conjuror of Chemicals”. In what way, unless referring to his paid work at Cambridge and the Mint, can we say that Newton was moonlighting? And in what way conjuring? I appreciate the fact that headlines need to sell but it is galling that in this case the headline goes for the old, discarded view when it is directly contradicted by the content of the article and the quotes from Newman. The real news is not that Newton was involved in alchemy, but the on-going efforts at transcribing Newton’s archive, which demonstrates just how much and for how long alchemy/chymistry was among Newton’s major activities, and the scholarship of Newman and others, which has shown jthat it was part of the intellectual scenery of the time. The news is that although Newton is a familiar name and a hero of modern science, the world he lived in and the ways he – and his contemporaries – thought are, by and large, very unfamiliar to us today. However, the thing that bugs me most is the fact that Newton has been ‘revealed’ as an alchemist, or as a magician, over and over again. In recent years the major popular interest in Newton has related to alchemy and prophecy, and such presentations tend to be accompanied by the suggestion that this is a surprising and novel revelation. This process goes back at least as far as John Maynard Keynes and his 1946 essay, ‘Newton the Man’, which presented Newton as ‘the last of the magicians’. Keynes had acquired a significant portion of the ‘non-scientific’ part of Newton’s archive (as judged by the scientists who catalogued and divided them in the late 19th century), and he was undoubtedly struck by what he found. But, as I have said in my book, he shouldn’t have been as surprised as he evidently was. Engaged in such an engrossing pursuit he threw aside fluxions, optics, and gravitation; and, with the glowing vision of the philosopher’s stone before his eyes, was blind to all prospects of sublunary fame or distinction, and desired nothing in life but the peaceful seclusion of his laboratory and the uninterrupted enjoyment of the pursuit of the grand arcanum. The review from which this quote is taken was by Baden Powell, Savilian Professor of Geometry at Oxford (and father of Robert Baden-Powell, founder of the scouting movement). Powell’s ability to accept Newton’s interest in alchemy, and his various character flaws, was part and parcel of the liberal outlook that saw him support evolution and broad-church theology (see his contribution to the famous Essays and Reviews of 1860 and Pietro Corsi’s excellent book Science and Religion: Baden Powell and the Anglican Debate 1800-1860, 1988). I don’t blame Newman and other scholars for using the media to their advantage. But what does our apparent inability to take on board Newton’s so-called ‘dark secrets’ – and to move on from the apparently constant need to re-reveal Newton’s interest in alchemy – say about us? Thanks for this thought-provoking meditation. It made me think about the significance and practice of historiography. I reckon every piece of historical meditation is motivated by some considerations far away from the historical object of the investigation, such as political, economic, sociological etc. And one or some mixed set of motivating powers result in diametrically opposed representations of the same thing. I mean selling an article, having an eye on the target audience and their expectations, i.e. fostering alchemy or discrediting Newton when associating him with alchemy and other variations of these. Is this not the case with Shakespeare, the question of authorship, his bisexuality etc? Adding to this another phenomenon makes the picture somewhat more complicated, and this other factor may be the educational system. In primary and secondary schools Newton is more often than not is celebrated as a modern scientist, (which is partly true, but only partly because of what you have claimed about the unfamiliar intellectual climate of his age), and this image of Newton’s being a modern scientist sinks in our cultural consciousness so deeply that new generations and even older ones may be surprised at other aspects of Newton’s interests all the time–naturally Newton scholars are exceptions to this surprise effect. A further twist to this cultural consciusness is given by the present fascination about magic and alchemy triggered by Harry Potter (books and movies), which again makes Newton as alchemist, magician more marketable. Thanks for your comments. As you say, the work historians do and the way they choose to present it in different circumstances is shaped by all sorts of factors, some of which they will be conscious of and others not. In the case of the NYT article, the headline was, I’m sure, nothing to do with Newman and probably little to do with the writer (it’ll be the work of a sub-editor who is more interested in getting something suitably headline-worthy than reflecting the subtleties of the real content). However, if media interest and financial opportunities are generated by research on topics like Newton’s religion and alchemy (which they are) historians need to think hard about their motivations, whether the topic is genuinely worth pursuing, and how they will present it to non-specialists. I think both of you have a point in bringing in the questions of (1) how Newton (still) is portrayed throughout high school courses as a completely rational and modern scientific character, regardless of all research in History of Science in the last 200 years – and hence this is the image most people will have; and (2) how media in general always tends to approach news focusing on what is expected from the target public, i. e., people who are supposed to understand Newton as a rational and modern scientist. This is all aggravated by the good and old issue of the Snowian two cultures. As a high school physics teacher myself, I am quite swamped in questions like this. Would it call for a reform of school physics curricula, in a way? Would school teachers need to go through a rather different formation instead? What is our role as historians of science (apprentice, in my case) in this? Another issue is the one touched by Zsolt: in my childhood years (quite a while ago, in the seventies), we would strive to read what was then called “Science Fiction”: stories about spaceships and space travelling, robots and so on. There was fantastic literature as well (viz. Lord of the Rings, of course), but nowadays I see the old concept of Science Fiction (as in Bradbury’s or Asimov’s novels) swallowed by “Fantasy” genre. Has our twenty-first century culture gotten more aware of the disastrous possible consequences of the use of technology (nuclear disasters, climate changing and so on) and then looked for salvation in magic, mythology and religion instead? At the same time we in general do not want to move away from the benefits of technology (for instance, internet), so I guess we live in this paradoxical compromise I would allow myself to call “technomagic”, so well exemplified by the success of films like Star Wars or Avatar. Are these our times, after all? Isaac Newton was a dedicated alchemist, a fact usually obscured as unsuited to his stature as a leader of the scientific revolution. Author Philip Ashley Fanning has diligently examined the evidence and concludes that the two major aspects of Newton’s research—conventional science and alchemy—were actually inseparable. In Isaac Newton and the Transmutation of Alchemy, Fanning reveals the surprisingly profound influence that Newton’s study of this hermetic art had in shaping his widely adopted scientific concepts. Both this example and the one you analyse are also very insulting to the memory of the late Professor Betty-Jo Teeter Dobbs (1930 – 1994) whose The Foundations of Newton’s Alchemy, or the Hunting of the Green Lyon (1983), is an in depth study of his involvement in alchemy and whose The Janus Faces of Genius: The Role of Alchemy in Newton’s Thought (1991) is an equally in depth analysis of the connections between his alchemy, theology and science. Thanks for pointing that out Thony – I’ll correct asap. I must have disengaged my brain at the moment of typing: I know very well that Powell was an Oxford man! And the Savilian professorships… (silly me!). Thanks also for adding the references to Dobbs’s books -very relevant. Ha – I really liked this post. “Newton was an alchemist, nooo you don’t say” was a sarcastic mantra throughout a lot of my undergrad history of science years. We got v sick of people saying “did you know Newton was an alchemist”, we’d roll our eyes and say “well, yes, we are doing a whole degree in this”. But then we were studying it fulltime, that’s why we thought it was patronising/ silly for them to say so. Which is where my question comes in – surely it’s ok that people who aren’t involved in professionalised history of science don’t know this stuff? (or if you think they should know it, you need to do a better job of telling people – it’s the same arguement I say to scientists when they complain about public/ media ignorance – probably not their fault… beware the “deficit model” and all that). Hahahaha! Just loved your story about doing a degree on Newton as an alchemist. It is a common situation: a whole generation of scholars finds out all of a sudden that they have been educated within a particular framework, say, behaviouristic “learn-to-do-the-math-and-shut-up”, and then when they get to positions of power (at least regarding what and how to teach their own undergrads) they tend to be overly aware of the things they see as faults in their own education. Hence your story. I guess it takes a couple of generations for the system to converge to a more stable state, to use a technical jargon. What I see happening now is that because of this “sudden” awareness that all knowledge has a history there is a wide movement in the direction of involving history of science and the different science curricula, perhaps first in university courses, but definitely starting to spread to teachers’ formative courses and then to high school courses. There is also a lot of people discussing if this is a good thing or not (T. Kuhn, for one, disagrees completely), and I think it is perhaps the most important issue going on in the field right now (but I may be biased here). Thanks Alice – it’s a very good point. However, it still seems strange that this is something that has been around in public (not just scholarly) discourse for so long, and yet never seems to be taken as read. Does it matter? I think it does. If people can “get” this one point, it could/should help them to understand a great deal more about the nature of science as well as its history. It challenges the notion that modern science sprang forth from one genius (or several geniuses) who were able to shake off the irrational or superstitious thinking of their time. It can, perhaps, help people understand that Newtonian physics did not leap from Newton’s mind fully-formed and unconnected to the age in which he lived, but was the creation of the many people who worked with and well beyond his ideas and texts. This, I think, is useful for people to grasp (for modern science communication as well as historical understanding) – that science is part of rather than outside the time and place in which it is produced, and that it will be reshaped when used elsewhere, at other times and by other people. This post wasn’t really meant to be a complaint against historians for failing to get their message across, but I realise that there is the question of our being complicit in giving the media what they think the public wants. From my reasonably limited experience of talking to the media I am very aware that they come to me hoping for a quick soundbite that confirms the standard story they want to tell. They’re generally not willing to listen to my attempts to reshape their questions or their narrative. In fact, in one instance, when I told the researcher that they had their basic facts wrong, they found someone else (who was not an historian) who was willing to repeat the standard, incorrect version. This must say *something* about what the media, of parts of it, are willing to adress and how much work they are willing to put in to get it right. My wife works as a manager in one of Brazil’s largest PR and press consulting companies. I hear the most amazing stories on a daily basis about the origins, processing and fate of what ends up being published or presented in the media. I will never be able to read a newspaper in a “normal” way again – for the good and for the bad. As far as I understood it, the best way to deal with media is to have at hand something you yourself prepared (a well-written press-release) that can address the issue intended by the journalist but without the awkward faults or the sensationalism they will feel the urge to put at it. If the text is good, short enough and goes to the point, he or she will most likely just copy and paste it, and feel very good about it. Perhaps we should try doing this more times before agreeing in simply “giving an interview”, in which most of the times reporters already have what they want and just want to add some quotation marks to the story, as they say. What I would do nowadays (not that it happens to me many times) is to ask the reporter to send in the questions by e-mail and then put in my words whatever I wanted the press release to say, in as short a manner as not allowing too much editing. It is an art, though. Which is a complaint scientists have been making for many years, surely…? Smells a bit like “bad history of science” – maybe that’s appropriate though. I’m not sure. I can’t help but hope there is a more productive way of working through this. I also think that it really is perfectly ok for people not to know this, or to simply fail to learn stuff like this until later in life. They know other stuff. There isn’t a canon of knowledge we all know about the world anymore (if there ever was). That’s ok. There is too much knowledge out there for us all to know everthing. As academics it can be really annoying that people don’t know what we know, but if we want the joy and worth of our specialist, detailed knowledeg, it is something we have to cope with. p.s. I do agree that knowing this can be helpful – I want people to know this! I just also think there are other useful things they might know instead too, and stuff I maybe “should” know that I don’t! I also think that it really is perfectly ok for people not to know this, or to simply fail to learn stuff like this until later in life. They know other stuff. As far as I’m concerned it’s not a question of people not knowing something but of publicists and journalists who do know pretending that nobody including themselves did know. Wow! Newton was an alchemist is unfortunately symptomatic for a general attitude of the popular media who deliberately choose to ignore the results of HOS research in favour of old incorrect myths. No matter how many times articles get published explaining that Newton was not the modern scientist that everybody thought he was about every six months a newspaper, television programme, magazine, radio programme or internet post broadcasts the extraordinary “news” that Newton was an alchemist, religious fanatic, Bible chronologist or whatever, as if this was a totally new discovery. The same applies to a hundred other HOS stories about Galileo, Kepler, Copernicus and so on and so forth. I think both Alice and Thony have points here. Yes, there are other and probably more important things that people do or should know. There’s plenty I should know and don’t. But it’s not quite the same as bad science reporting. History of science is rarely top news: there is unlikely to be pressure on journalists in terms of time, getting hold of adequate sources, conflicting expert opinions etc. It is more likely to be in reviews, general interest, the ‘light relief’ story etc. This, of course, adds pressure on historians to please, as we have to be grateful for any exposure, but it should also mean that journalists and researchers have the time and resources to get the story right – or to work out that their story is very old news indeed. Alice – if you have any tips, or can suggest some “more productive ways of working through this”, let me know! I don’t think this is necessarily something that everyone ought to know, but I feel that anyone who discusses Newton in a published article, broadcast programme or even (perhaps) classroom ought to have a stab at getting to grips with it. Which all brings us to a bigger question: what purpose to the traditional science myths serve today? They were created when science had a much less certain place in society. Things have moved on, and I don’t believe they serve the interests of science as they, arguably, once did. I would, personally, urge science teachers to either get some basic understanding of issues like this or to leave out the history all together. Their is a usefull diffrence to be made between myth and legend for the purpose of analysis and these are legends, I would refer to them specificaly as foundation legends. I think precise use of terms is important here. Particularly with the way in which fairy stories or folktales (which are fictional narratives told for entertainment) are with out fail confused with other forms of narrative on science blogs. But thats my own personal bugbear. Gomme’s observation made over a hundred years ago still remain the case today. Things have not moved on in this case either. This sounds an interesting debate, and not one with which I am familiar. In history of science I would say that ‘myth’ is the preferred term, especially ‘foundation myth’ rather than legend. Can you, succinctly, explain the difference as you see it between the two? I leave aside fairy or folk tales as something clearly rather different. They are the standard genre terms used in Folklore studies. There is a considerable amount of overlap between all three terms. Basicaly myth refers in most cases to sacred material from a very remote period of the past. Legend refers to a much more recent time period and is more secular in tone. The way myth is used in H.O.S is in keeping with popular usage of the term. Its been a topic of disscusion in folklore for years but limited to that subject. The distinctions are usefull I think particularly for wider comparative research. I wondered in youre somewhat interesting previous post on popular accounts of astronomy if their was a possible genre overlap between legend and folktale at work in the discriptions. No evidence to suggest it is the case but I would not find it surprising to see such motifs appear in folktale, given the age and entertaining nature of the discriptions. William Bascons, “The Forms of Foklore, Prose Narratives”, is the standard introduction to the topic and explains things better than I would. P 45 of Allan Dundes, ‘Binary Opposition in Myth..’ breifly refers to the origins of the genre distinction, in his disscussion of an argument between Propp and Levi- Strauss. Hello, I am a French alchemist and I have just published the English version of my alchemical training.